NOTE: FPL– Federal Poverty Level. The U.S. Census Bureau’s poverty threshold for a family with two adults and one child was $19,318 in 2016. 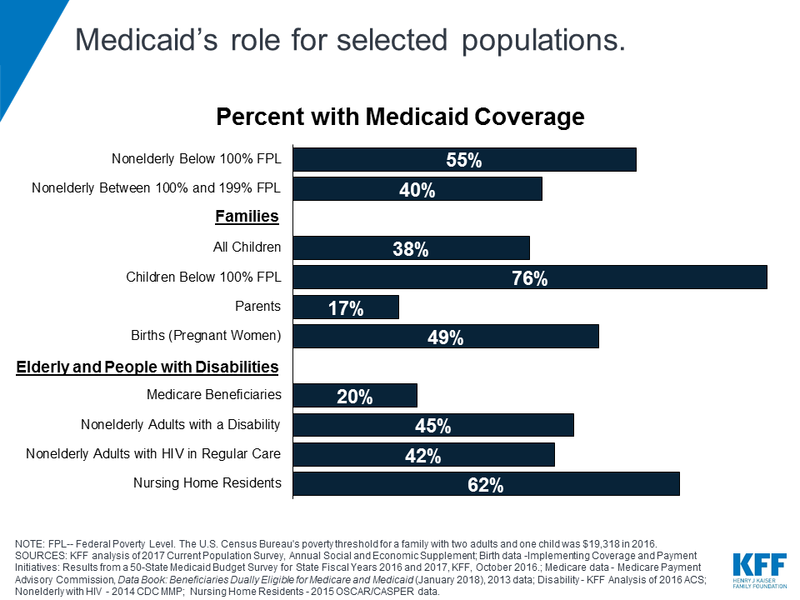 SOURCES: KFF analysis of 2017 Current Population Survey, Annual Social and Economic Supplement; Birth data -Implementing Coverage and Payment Initiatives: Results from a 50-State Medicaid Budget Survey for State Fiscal Years 2016 and 2017, KFF, October 2016.; Medicare data – Medicare Payment Advisory Commission, Data Book: Beneficiaries Dually Eligible for Medicare and Medicaid (January 2018), 2013 data; Disability – KFF Analysis of 2016 ACS; Nonelderly with HIV – 2014 CDC MMP; Nursing Home Residents – 2015 OSCAR/CASPER data.